I’ve seen and made a lot of laborious recipes for chicken and dumplings, but none can compare to the deliciousness and simplicity of my Granny’s. At first, I was aghast that Granny used a can of biscuits instead of making her own dough as she would for her pies or seemingly any other recipe. However, the taste and the ease of this recipe outweigh the fact that the “dumplins” come from Pillsbury. To boot, if it was “homemade” enough for my sweet, Hillbilly granny to serve us younguns, it’s good enough to repeat. Delcie Skaggs of Moon, Kentucky stopped attending school after the second grade and married my grandfather, proud WW2 navy vet Carl None Hamilton years later. My Popaw didn’t have a middle name, but since military ID tags required one, his has been “None” since volunteering for the service. The two had three children, and the youngest is my father. Granny passed away in 2010, but fond memories and great recipes remain. 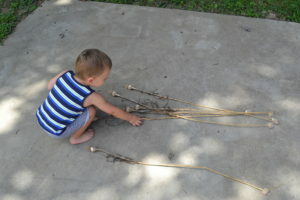 I started by having my toddler select some dried garlic for the broth. Homegrown garlic is incredibly delicious and flavorful. A big thanks to our Ball-Ball and Gigi for growing it for us. 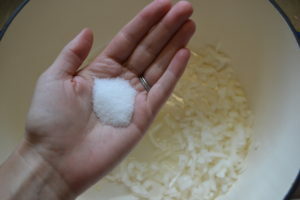 I chopped up some of an onion into fairly small pieces and added that, the minced garlic, and a dash of olive oil into the pot. Some people add carrots and celery, my granny never did–so I don’t either. Next, came the salt and pepper. 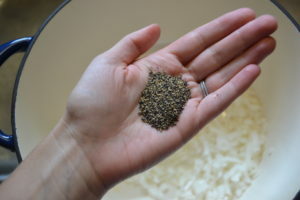 Appalachian cooking typically incorporates cheaper cuts of meat. For this recipe, I used one such cut: chicken thighs with skins and bones. Although it does add a step (skinning and boning later), it’s more economical and is the best choice for a rich chicken broth. 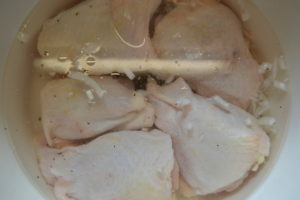 Pour water generously over the chicken and bring to a rolling boil. 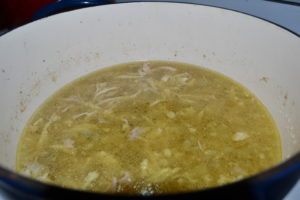 Once chicken was boiling, I lowered the heat to a simmer and partially covered it. After 30 minutes, I removed the chicken from the broth and let it cool. I proceeded to remove the skins and the chicken from the bone, shredding it into a bowl. After I had separated all of the chicken, I returned it to the broth. 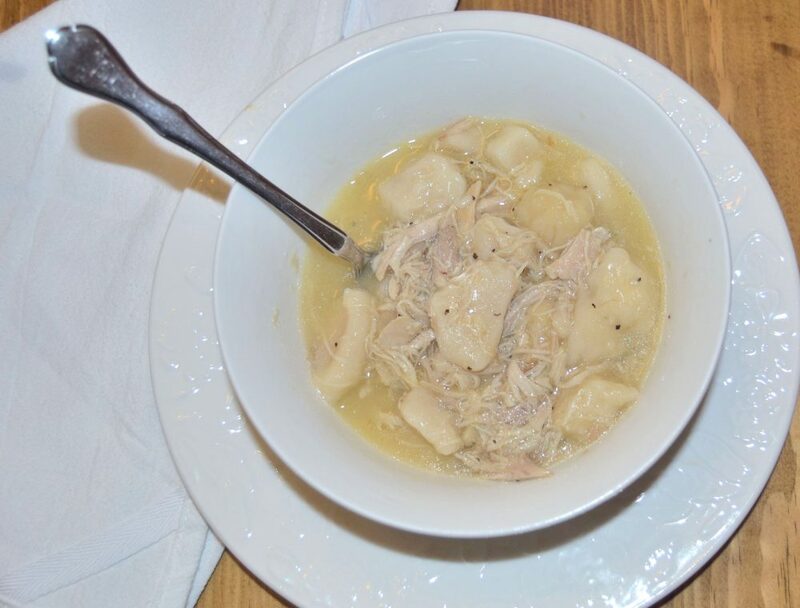 This is the perfect broth base for many dishes: chicken and noodles, chicken noodle soup, chicken and dumplins, chicken and whatever your heart desires;). On a clean, floured surface, I prepared my can of Pillsbury Southern Homemade Biscuits. 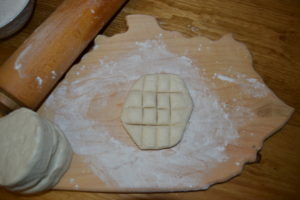 I rolled out each biscuit to be about 1/8″ thick and then cut the biscuit into my dumplings… about the size of a double communion wafer or a small thumb. Standing over the pot, I returned the chicken and broth mixture to a rolling boil. Wooden spoon in one hand and dumplings in the other, I dropped each individual dumpling into the spot, stirring as I went. They puff up quickly, but don’t worry, the dumplings cook down. 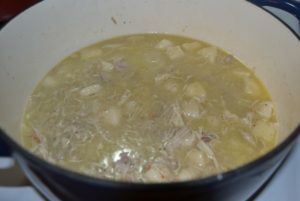 Now, the easy part: Lower the heat to a slow simmer and partially cover for 30 minutes to all day long, stirring every so often so that nothing sticks to the bottom. Enjoy the welcoming aroma of the garlic and gluten in your home and don’t worry about washing dishes later–bowls are going to be licked clean! 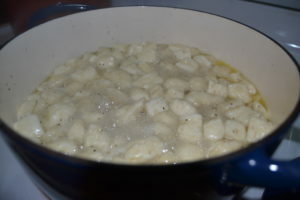 In a large pot, add olive oil, onion, salt, pepper, garlic, and chicken. Cover chicken generously with water. 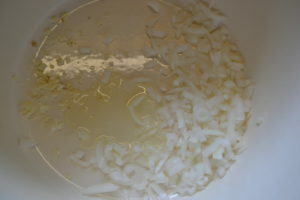 Bring contents to a boil, then lower to a slow simmer. Partially cover and cook for 30 minutes. 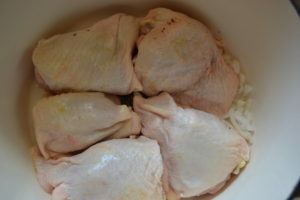 Remove chicken from broth and remove skin and bones from thighs. Shred chicken and return to broth. 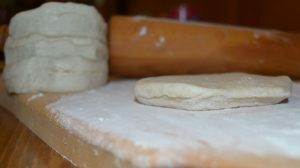 Prepare biscuits by rolling them out on a clean, floured surface to 1/8″ thickness. Cut biscuit into a double communion wafer size. 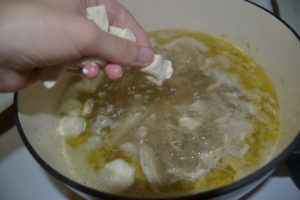 Standing over the chicken broth, return to a boil and add each dumpling into the broth while stirring. Return to a slow simmer, partially cover, and cook for at least 30 more minutes (can go all day if cook temp is low), stirring occasionally to prevent contents from sticking to bottom. Serve! Yield: 4-6 servings [potentially more, but hubby likes to be real full and kinda miserable;)].